This is an reoccurring Sunday evening problem, when I rack through my brain to come up something to say with my outfit post. I suppose, I am again going through a phase where I can't find succinct thoughts to write about on the blog. Mostly I don't have anything to say, and when I do I shrug it off because I don't want to add to the unnecessary noise on the internet. So much news, so many opinions, so much content, not enough time to even read and process it all. For now I think I happy to keep this space as an indulgence in a bit of sartorial entertainment and share just a tad bit of my life and then get on with the day. Moving on to the outfit, we are in-between winter and spring (temperature wise). So even though the sun is shinning hot and bright you cannot just get go out without light layers. 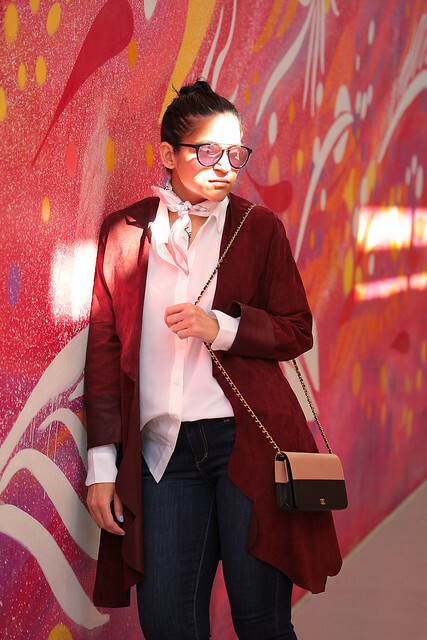 Nothing exceptional in this look except bringing my suede coat back after a while (click here to see another look with the same coat) and styling it with a recent purchase: neck scarf! Cute boots and love your jacket!! Great outfit. You are looking really smart in it. I just love the shades. Girl you are rocking every aspect of that outfit! It all looks fabulous on you. I wish I had your sense of style to be able to throw amazing outfits together. Those boots are my favorite! Yea, I had nothing to write in today's post either, lol. 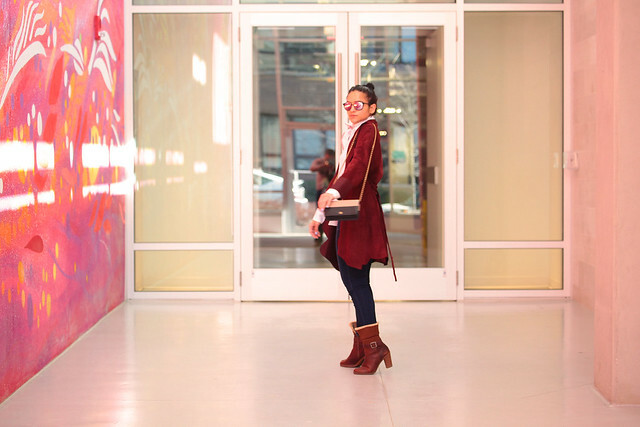 I love how the background really brings out the color of the suede coat and your boots, too. Awesome buy with that neck scarf. I'm a big fan of dusters and i love the color of the one you have on in the pics. So in love with the velvet. I am in awe of your fashion sense Tanvi it is gorgeous. The red suede coat is incredible! What a beautiful outfit. Thanks for sharing with us. Great outfit. Those boots are amazing, as is the scarf. It's also between seasons/weather here, so I definitely dress in layers too. Perfect outfit for these spring days where you go through all four seasons! I especially love the jacket and neck scarf. I love the color of your coat! Such a great and versatile piece for spring. I loved your dressing style. It’s modern yet conventional. That dark denim is my beloved color. Your jacket is just awesome and pairing so well with the whole look. Love this outfit! I wish I could still wear boots but it's already getting hot in the Arizona desert! 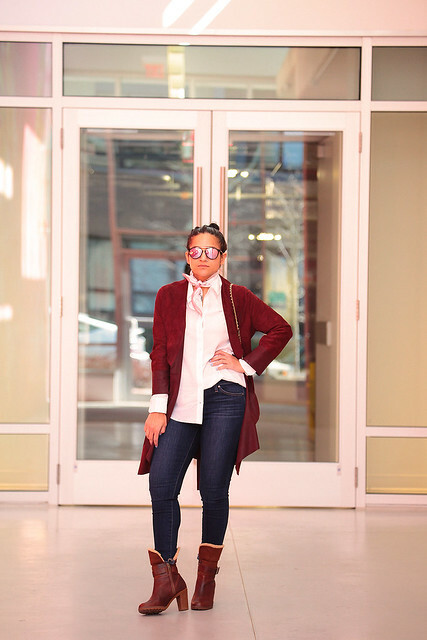 Love the blazer, haha and I love reading your thoughts in writing this post. I have those days too! You look so chic! I love how you styled this outfit! You have such cool style- I wish i could pull off fun boots like those! I love the look. The outfit is so cute. Cute outfit. Yeah! This is the type of weather that you just cannot figure out what to wear. The temperature not so bad during the day but then at night, it’s freezing. But... hopefully it will warm up. I think we all feel like that sometimes. I feel like on my blog I am often just repeating myself while explaining nail art. Your blog never fails for a good read though, its always enjoyable. I am loving this outfit, it looks really comfortable and still smart. The glasses.. I want! I feel you, sometimes you can't be unique everyday or feel like repeating. I love your outfit! You can never go wrong with red! love this look! the scarf makes it look so polished! This is a great look! I’ve never worn a neck scarf before. I really like the outfit it’s paired with. 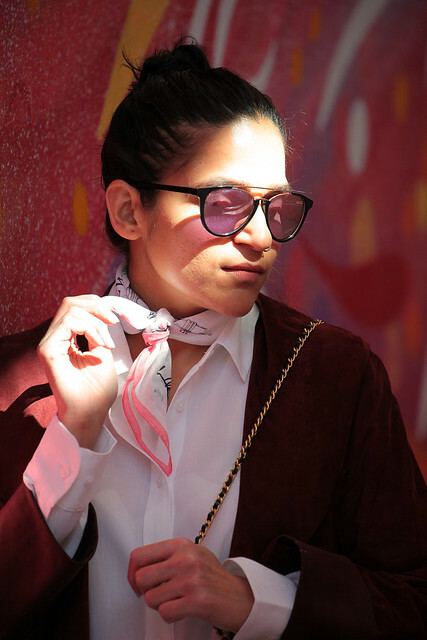 Such an amazing look Tanvi, the outfit is so well put-together. 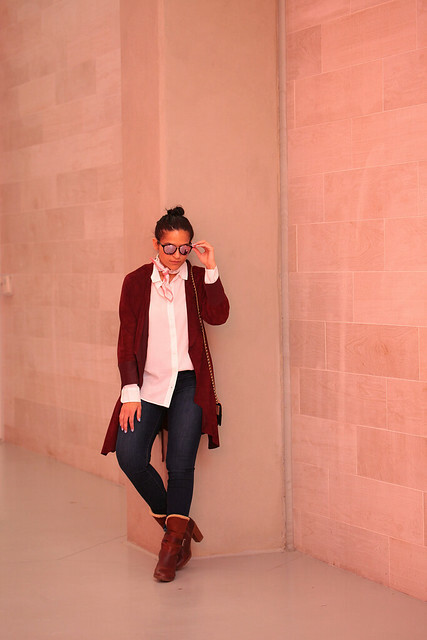 I like the red suede coat, classic yet gives that modern chic touch to the whole look. The scarf looks so pretty. Overall, a really lovely and beautiful post and photos. You girl looks gorgeous. I do really like your outfit and you looks stunning on it. I love the color of your blazer and your boots, so stylish. I sometimes have the same impression you have! I have nothing to say... well, it's not I "don't" but I want to keep the blog like a happy break, just to unwind my head and see pretty nails or eyeshadows, that's all. What I usually do on my blog especially on makeup and nail articles, is to share little bits and pieces of my everyday life. I know that's uninteresting for most people, but as an expat, I have family and friends who are far from me, they care to know what my small life is like, so I write for them. I use small talk and small words because most of them are not English speakers! I enjoy very much your outfit posts, but also I find myself to agree with many deep writings you've shared here, so definitely I feel affinity with your blog! I love the outfit. That stunning red jacket really catches the eye, but I think those boots are the key to the entire outfit. i love that sweet feminine scarf detail! I LOVE your outfit, you are seriously so stylish! I struggle with what to write sometimes too, so I completely get what you mean! cute fall outfit. 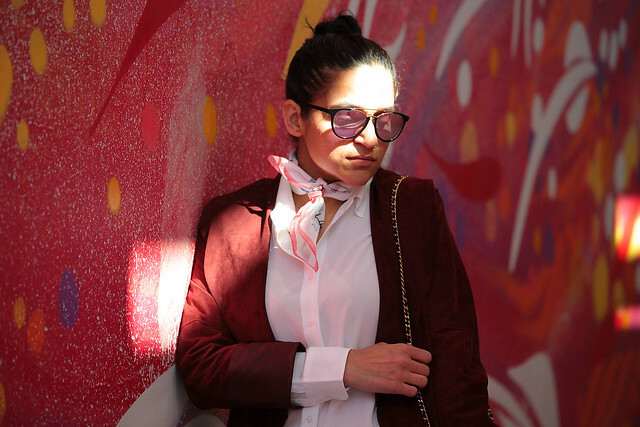 It's been a while since I've seen a scarf tied that way but it looks absolutely fabulous with your outfit.